GARDEN CITY, N.Y. — Former MLB pitcher, Dwight Gooden, is scheduled to appear on Weds. Dec. 3, 2014 from 6:30 pm to 8:00 pm to meet and greet fans where he will sign autographs and memorabilia at the Steiner Sports Store located in the Roosevelt Field Mall in Garden City, NY. Gooden, nicknamed “Dr. K”, is a former MLB pitcher who played for the New York Mets and the New York Yankees in the mid and late 1980s. 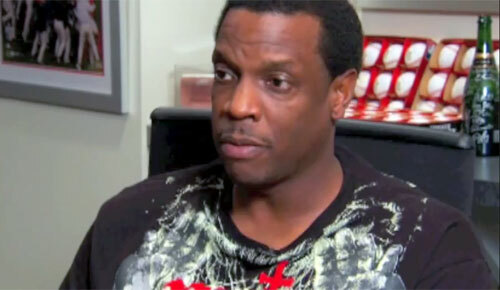 Photo shows Dwight Gooden in a sit down interview in 2010 speaking with Brandon Steiner. Watch the following video where Dwight Gooden sits down and talks with Brandon Steiner about the ups and downs in his personal life and his career. Get to know the true Doc Gooden as Brandon asks him tough questions about how he got where he is today. This was aired on the YES Network in August/September of 2010. Dwight Gooden was one of the most dominant and feared pitchers in the middle and late 1980s. He ended his career as a mop-up reliever for a championship team. He made one relief appearance in each of the first two rounds of the playoffs, both times with the Yankees trailing. Gooden did not pitch in the 2000 World Series against the Mets, though 2000 would be the 3rd time he received a World Series ring. Sports Speakers 360 is a booking agent for pro athletes. If you would like to book Dwight Gooden for a speaking engagement, appearance or endorsement, contact Dwight Gooden’s booking agent for fees at 1.855.303.5450.